What is up my crafty people?! My name is Stephanie and I am an illustrator and crafter and all around artsy fartsy (mostly artsy) person! I have been illustrating in the craft industry for a few years now and I am madly in love with the genre and the people and the VIBES I get when I am in this industry. People helping people be creative is always a good thing. Creativity is vital to happiness in my opinion? Right?! I had the privilege to draw this set called Strangeness for Simon Says Stamps and couldn’t be happier with how it turned out! She is springy and she is versatile and she is absolutely incredible! I am very proud of her. Before I began working in the craft industry I made my way as an artist by doing custom tattoos for people all over the world. So my style is heavily influenced by tattoo art of many genres. 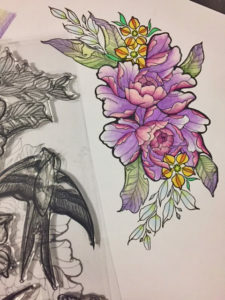 The birds in this design feel a little bit American Traditional style and the peonies are more influenced by Japanese style tattoo imagery. 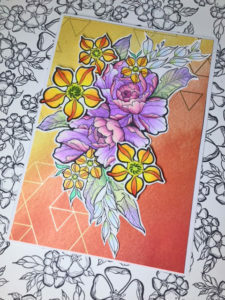 I have been on a Prismacolor Pencil streak lately so I decided to keep things traditional and color the flowers for a beautifully colorful card. I like to find an art media that I love and then do it over and over again until I am tired of it and find something else! Right now I am smack in the middle of my Prismacolor stage so I am embracing it fully. I am still building my craft supplies and I did not have an acrylic block big enough to fit my stamp and I don’t have a fancy stamp assistant like the Misti yet so I used an acrylic clipboard to mount my stamp. Worked like a charm! I like to use a permanent ink to stamp so that I can paint or color them without worrying about it budging. I used Ranger Archival Ink, Jet Black, to stamp this image on 110 lb Neenah cardstock. Then I simply colored it! After coloring it and the accompanying little flowers I fussy cut each of them and arranged them and used American Crafts foam dots to tack down the flowers. Since it is such a large stamp I had to get creative with placement but I think you could easily get creative with how to use it even on smaller cards! I hope you love her as much as I do! If you choose to use my stamp set and make pretty things I would LOVE to see your creations! Be sure to tag me on Instagram (@stephanie.low.creative and #StephanieLowCreative) or facebook (Stephanie Low Creative). Thank you for checking me out and for listening to my short story! Keep making art and keep sharing it with the world! !AND NOW FOR A SPECIAL BLOG HOP! 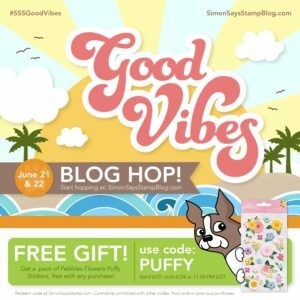 SIMON SAYS STAMP is having a blog hop to celebrate their Good Vibes collection launch and my pretty stamp gets to be part of it. Use the code PUFFY for a pack of Pebbles Flowers Puffy Stickers free with any purchase, offer expires Sunday, 6/24 at 11:59 pm ET. so get on this ASAP! 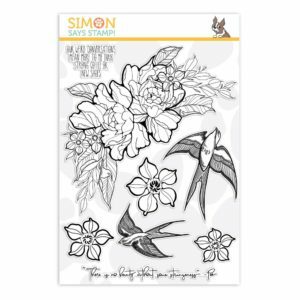 Also consider commenting on the blogs for a chance to win a $25 coupon to the Simon Says Shop! HOP ALONG to my crafty friend’s blogs in order to be inspired, enter to win and look at pretty things!